Description: A ladies cosmetic bag with fabric lining inside and a soft leather on the outside ideally to fit into the ladies handbag. 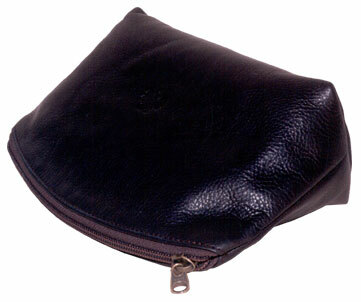 It gives a quick access to the make-up kit in this lovely soft leather bag. The closure is by a zip on the top with a metallic puller. Size is 23 x 14 cm. The model can be made in different types of leathers like Cow Polished, Cow Nappa, Cow Vegetable, Buff Resin, Buff Glazed, Buff Vegetable and Cow Softy. The colours available are black, blue, brown and shades of cognac and burgundy. 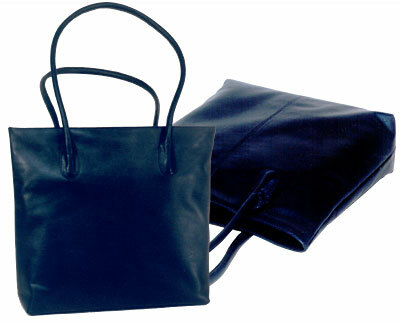 Description: Ladies Shopper bag in finished cow leather nappa having a zip compartment and an inside pocket with zip. The front portion of the bag is plain while the back has a joint in the centre. The handle has a drop of 29 cm. The model can be made in different types of leathers like Cow Polished, Cow Nappa, Cow Vegetable, Buff Resin, Buff Glazed, Buff Vegetable and Cow Softy. The colours available are black, blue, brown and shades of cognac and burgundy. Description: This is a finished cow portfolio bag with a design on the flap. 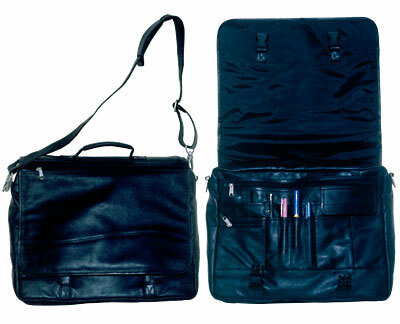 The front portion has an organiser with a pen slot, credit card slots, a small zip pocket, small pocket with a flap and provision for a key holder. The bag has two compartments, one of which is open and the other is closed by a zip. The back part has a joint and there are provisions for shoulder straps. The model can be made in different types of leathers like Cow Polished, Cow Nappa, Cow Vegetable, Buff Resin, Buff Glazed, Buff Vegetable and Cow Softy. The colours available are black, blue, brown and shades of cognac and burgundy. 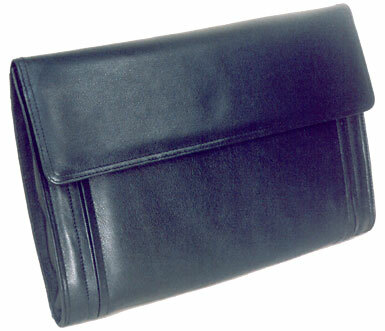 Description: This leather men's folio bag is of size 34 x 3 x 24 cm. It has two front zippers that open up the organiser portion. The inner part of the organiser has a zip pocket, card holder and pen slot. The folder has an additional compartment for keeping documents. The model can be made in different types of leathers like Cow Polished, Cow Nappa, Cow Vegetable, Buff Resin, Buff Glazed, Buff Vegetable and Cow Softy. The colours available are black, blue, brown and shades of cognac and burgundy.